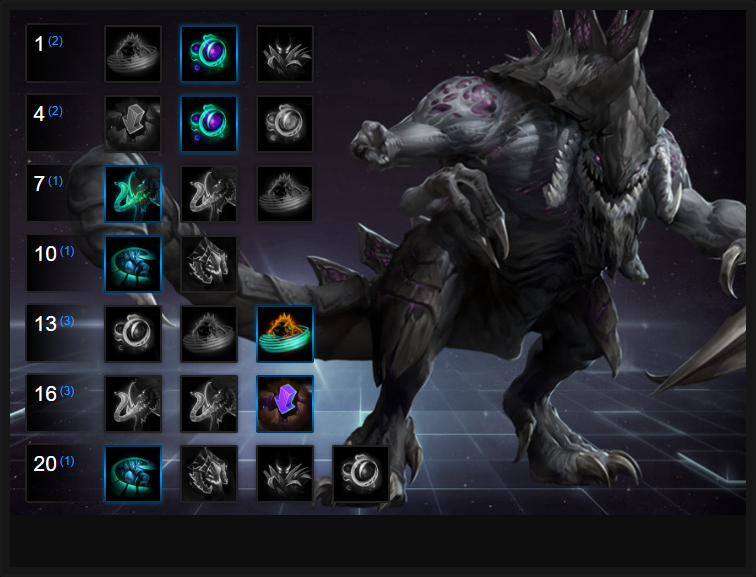 In this Dehaka Build Guide, we provide an overview of his strengths, abilities, talents and matchups. Dehaka is a mobile, flexible warrior that brings not only utility but versatility to any team composition. Capable of tunneling underground instead of using a mount, he can move quickly to anywhere that has a bush or a vent. This makes him particularly strong at bullying in lane and supporting his team mates. His ability to pull enemies with Drag, combined with an invulnerability (Burrow) makes him a nuisance. Finally, his trait - Essence Collection - provides him with a high amount of sustain as it heals him for a large quantity of health once you've collected enough Essence. The one downside to Dehaka is the fact you need to farm Essence if you're to be effective and if your Brushstalker (mount replacement) is off cooldown, you can be very vulnerable if you dive too deep and need to escape. Essence Collection (Trait) - Providing Dehaka with some much needed survivability, Essence Collection offers an exceptional heal over time. With a maximum of 50 Essence to collect and with Hero takedowns providing 10 and minions 2, it's fairly easy and quick to maximize it. On consumption you gain health over 5 seconds for each Essence stored. It's a huge amount of healing and makes life much easier for your healer. The fact you can also using it during Drag and Burrow (Burrow especially) makes it particularly useful as you can regain health while immune to damage. Brushstalker (Z) - This active ability, instead of a mount, allows Dehaka to burrow to any bush or vent anywhere on the Battleground. When you press Z, all these locations will appear on the mini-map. You're then free to activate your burrow, and appear where you selected. What makes Brushstalker so strong is the fact you can quickly change locations, allowing Dehaka to split-soak, or to bully an objective. On Battlegrounds such as Dragonshire or Braxis Holdout, this can be particularly effective as in an instant, Dehaka can turn a fair fight in his teams favor. Just be aware that it takes a few brief moments for Dehaka to submerge and you can be killed in this time. Drag (Q) - Functioning similarly to Stitches' Hook, Drag works in a similar way. It has a much shorter range, but allows you to tether yourself to an enemy. Once you've struck them, you can pull them towards you for almost 2 seconds. It's amazing for bringing enemy players out of position and allowing you to quickly kill them. It's also important to note that you can use your basic attacks and Dark Swarm against any enemy caught by your Drag. Dark Swarm (W) - Dark Swarm is unique in that it allows Dehaka to move through enemy Heroes, rather than being body blocked by them. It also causes AOE damage to all enemies near him for 3 seconds, dealing double damage to Heroes. Interestingly the skill can also be cast while you're underground with Burrow, meaning anyone surrounding you will take damage. Try to always use Dark Swarm when you've used Drag against a Hero so that they take maximum damage from it. Burrow (E) - Burrow functions similarly to Iceblock, with the difference that it sends you underground. The invulnerability lasts for 2 seconds and once it ends, you'll poke back up where you dived down. Considering Essence Collection can be used during this time (alongside Dark Swarm), its invaluable mitigation. Burrow is invaluable at avoiding a burst from heroes such as Kael'thas or for buying time for your team to come to your rescue, or to wait out a cooldown. Burrow can be cancelled early by pressing E again when underground. Isolation (R) - Isolation slows and silences the first enemy it hits as well as significantly reducing vision radius. In a team fight it's especially powerful due to how often players group up, you're more than capable of hitting at least one target. It's a very offensive, high pressure Heroic that should be aimed at a healer (preferrably) or a high value squishy target. Just be aware there's a minor delay on its cast and the range is short - don't waste it! Adaptation (R) - Providing a Heroic similar to Kharazim's Divine Palm (sort of) Adaptation heals you for 100% of all damage received after 4 seconds. Great before you enter a fight, you just need to time its use to ensure you not only survive for 4 seconds but can then dive back in once it triggers. Try to arm Adaptation slightly early and when you expect incoming damage - otherwise you'll die and it won't trigger. Allowing Dehaka to gain 10 Essence per Regeneration Globe, Tissue Regeneration also allows Dehaka to increase his health regeneration by 4, up to 40, per every 50 Essence he collects. Not only that, but Tissue Regeneration also allows Dehaka to collect 60 Essence - 10 more than default. Key to playing Dehaka is to utilise his Trait. Not only does it give you constant sustain but allows you to pressure in a team fight for much, much longer. One-Who-Collects increases your Essence collected from Minions by 50%, granting you 3 stacks per minion killed. A single wave is enough for almost 25 stacks. Feeding Frenzy allows Dehaka to reduce the cooldown of Drag by 2 seconds with every basic attack. Considering it's his primary form of engage, having it constantly available is a must. Variable: Dehaka needs to be in amongst enemy players to be effective and Symbiosis - when he's doing this - allows him to lower the cooldown of Dark Swam by 0.4 seconds every time he damages an enemy hero. Against a group of players, it allows for near permanent up-time on Dark Swarm. Allowing Dehaka to silence and slow a target by 30% for 3 seconds, Isolation also deals impact damage and ensures total shut down on one target. Anyone affected by it can either be ignored, or collapsed upon for an easy kill. Variable: If you're the solo Warrior take Adaptation as it significantly improves Dehaka's survivability. Once triggered, after 4 seconds he's healed for 100% of the damage he took over the period. Although you can still die easily when it's active, if you trigger it early and survive lots of front-line pressure, you'll be back to full health in no time and are free to then use your Essence. Providing a Vulnerability to any enemies affected by Dark Swarm, Primal Swarm causes a 10 armor loss for 0.75 seconds, causing players to take 10% extra damage. If you can use Drag against an enemy, maintaining the armor debuff is incredibly easy. Providing Dehaka with amazing amounts of mitigation and mobility, Tunneling Claws allows you to move while using Burrow. Its duration isn't long (2 seconds), but is more than enough to reach safety and also ensures when you do pop up, you're still stealthed. Allowing Isolation to spread from the point of impact, Contagion can shut down an entire team if they're stupid enough to group together. A well placed Isolation at level 20 can spell disaster for any team hit. Variable: Key to Dehaka and his playstyle is Brushstalker and allowing you to use it every 55 seconds is absolutely incredible. You can constantly go back to base and back out to the Battlefield in an instant and on maps such as Dragonshire, it's incredibly strong. This list of tips and tricks are just a handful of things we think will help your Dehaka play. We'll continue to add to the list as required and if you have any tips you'd like to share, let us know in the comments below and we'll place them here. 1. Remember that Dehaka's Trait provides you with a powerful heal over time. You should always ensure you have maximum stacks before engaging in a team fight. 2. Burrow provides complete immunity to damage for 2 seconds. Use this to buy you time to avoid damage or for your team mates to arrive. 3. When using Burrow you can use any other skill except Drag. If enemies are around you, use your Essence to heal up and then Dark Swarm for when you reappear. 4. Drag doesn't have a huge range so try not to over extend when using it. You'll find yourself out of position and you can be focused quickly. 5. Despite Burrow being particularly strong (it's effectively an Iceblock at level 1) it can still leave you open to being surrounded and then ganked. 6. Always try to use Drag on a target that can't escape easily. Li Ming for example can blink away after it ends, so try an alternative hero such as Jaina or Lunara. 7. Although Dark Swarm is an offensive ability, the fact it allows you to walk through enemy Heroes makes Dehaka the only Hero in the game that can't be body-blocked. Remember this when the enemy team are trying to prevent you escaping. 8. At level 1 it takes 25 minions to kill before your Essence is full. Staying in lane, or using your Bushstalker to move between lanes to maximize your intake is a must. 9. Remember that Dehaka has no escape skills and until level 13 is very vulnerable to roots, stuns and hard crowd control. Don't over-extend. 10. Your lack of mount is a negative and positive. It means you have global map presence (which is amazing) but it also means on large maps it can take you some time to cover them when your Bushstalker is on cooldown. Factor this in when picking Dehaka or when an objective is due. 11. Remember you can only use Bushstalker on vents and bushes. If you're out of position and there isn't one nearby, you're in trouble. 12. Dehaka is strongest on Battlegrounds such as Braxis Holdout, Warhead Junction and Dragonshire where he can quickly switch lanes to over-power a lane.